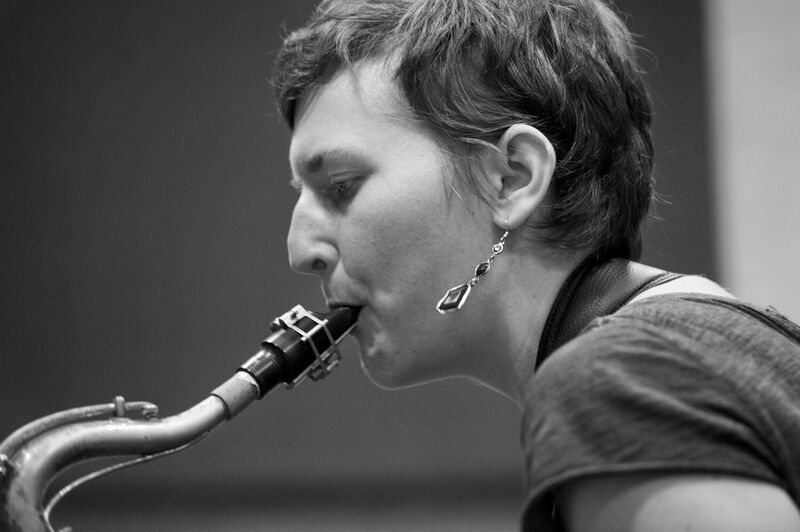 Anna Webber is an integral part of a new wave of the Brooklyn avant-garde jazz scene. A saxophonist and flutist who persistently avoids the expected, she is also a forward-thinking composer. Webber’s most recent album is SIMPLE, a trio album with John Hollenbeck and Matt Mitchell that was released on Skirl Records in September 2014. Her other projects include Percussive Mechanics, a raucous Berlin-based double-drum septet, Jagged Spheres, a collaboration with Devin Gray and Elias Stemeseder, and her Canadian quintet Montreal People. An in-demand sideperson, she plays with the Adam Hopkins Quartet; Noah Garabedian’s Big Butter and the Eggmen; the Erik Hove Chamber Ensemble; the Marike van Dijk Large Ensemble; the Martin Krümmling Quartet, whose 2012 album The Vision Behind features Mark Turner; and Fabian Almazan’s Biophilia wind sextet, among many others. Furthermore, she appears on Stefon Harris’ Grammy-nominated album Urbanus (Concord Records, 2009). Webber has toured throughout the USA, Canada, and Europe as a leader and a sideperson. In 2014 she won the BMI Foundation Charlie Parker Composition Prize as a member of the BMI Jazz Composers’ Workshop. She is the winner of the 2010 Prix François-Marcaurelle at the OFF Festival of Jazz in Montreal. She has been awarded grants from the Conseil des Arts et des Lettres du Québec and the Canada Council for the Arts and residencies from the Brush Creek Foundation for the Arts and the Millay Colony for the Arts. Webber is originally from British Columbia, Canada.